By Ahmed Bilal on December 2nd, 2010. 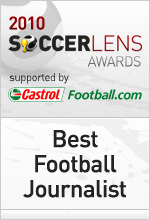 The 2010 Soccerlens Awards are now open for voting! Get in and vote for your favourite sites and writers NOW! From nearly a thousand nominations, we have shortlisted 86 candidates across 10 different award categories. Several past winners and runners up feature again this year, a testament to their consistency and commitment to excellence. We have many new faces as well, and while the football space is more saturated than 2007 when we first started the awards, we have also have that much more quality and higher standards of writing and journalism. You will find your favourites sites and writers in there. You may also have reason to complain against the exclusion of certain sites / writers. To those who missed out this year, I offer two reasons – you either weren’t nominated or you were considered and then benched in favour of a more deserving candidate (in our eyes). Our goal is to pick the best of the best, not just those with most readers, most nominations or most effort put in. I’m confident that between our shortlists and your votes, we will end up with the best sites and writers of 2010. You can start voting by looking at the awards categories on the right (or go to the 2010 Awards page), and tell your friends by tweeting us or following us on Facebook.